ImageSnap turns standard white ceramic tile, the same tile you can buy at home-improvement stores, into photo tile. Daltile manufactures most of the tile we use, but we may use other brands depending on availability. Sizes of ImageSnap’s photo tile conform to building industry standards. Standardization means that ImageSnap photo tiles should conform to ceramic tile sizes already found in your home or office or tile sizes you are using in a new project, including trim pieces. ImageSnap sells several sizes of photo tile; read about each on our products page. Note: All of the tiles are approximately .25″ (.635 cm) thick. 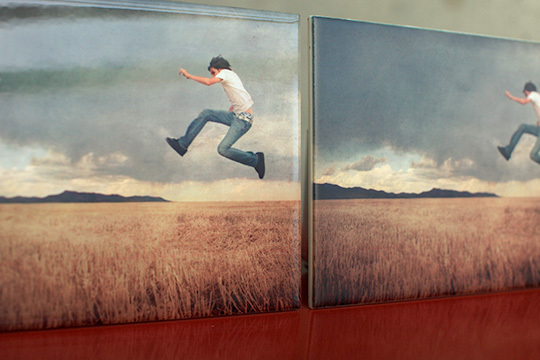 ImageSnap prints its photo tiles using a scientific phenomenon called dye-sublimation. Sublimation is the process by which a solid state transitions to a gas phase without passing through an intermediate liquid phase. ImageSnap’s solid state is ink on paper. The ink becomes a vapor when heated, and the vapor dyes a melting polymer (polyester) coating that has been applied to the tile’s surface. Our gloss photo tile are susceptible to swirl marks if not cleaned or installed properly. Matte finish is more durable and less susceptible to these marks. ImageSnap photo tile will last for years if handled like any fine furniture. ImageSnap has made thousands of photo tiles over the years using this printing method. Matte and Gloss finish comparison. Printed photo by Cole Rise. ImageSnap photo tile is available in both gloss and matte finishes. The tiles may exhibit small bumps and pits on the surface, but these imperfections are very small, appear mostly on glossy tiles, and usually are obscured by the printed image. Gloss finish: This finish is high-gloss and provides a brilliant canvas for the best reproduction of artwork and photographs. Gloss finish is susceptible to swirl marks if cleaned with a paper towel or an abrasive cloth. These marks do not affect the printed image, but may be visible in certain lighting conditions. Gloss tile may be used in a wet environment, but the tile should be kept clean to avoid water stains. Matte finish: This finish is resistant to abrasions. We recommend its use on tabletops and for trivets, or for any surface that will have items placed on it. Colors will appear softer compared to images on a gloss finish. Matte tile may be used in a wet environment, but the tile should be kept clean to avoid water stains. ImageSnap photo tile may be installed with ceramic tile mortar and grout just like any other ceramic tile. But there are a few precautions. ImageSnap recommends using an unsanded grout, and no matter what grout is used, have your tile setter mask off the tile surface using paper and a low-tack tape. Check to make sure the tape will not harm the tile surface. The masking will protect the tile surface during installation. After installation, clean the tiles with a non-abrasive cleanser and a soft cloth. The image on the photo tiles is permanent, but can be scratched with a sharp object like scissors, knives and screwdrivers. Should ImageSnap photo tile be used outdoors? ImageSnap photo tile will last indefinitely if used indoors, but it may fade if used outdoors. ImageSnap suggests that all of its tile be kept out of direct sunlight. ImageSnap has sold photo tile that has been installed in swimming pools, outdoor murals in shaded areas, and as design elements in custom outdoor furniture. ImageSnap has had reports of its outdoor photo tile beginning to fade in as little as six months. We also know of outdoor applications that haven't faded in years. Fading time depends on how much sun your ImageSnap photo tile receives, and whether or not the tile is in a protected area. ImageSnap also has made hundreds of photo tiles for grave markers and monuments. Because the cost of an ImageSnap photo tile is less expensive than alternative printing methods, customers buy our photo tiles knowing that the tiles could fade and might have to be replaced over the years. ImageSnap’s ceramic photo tiles require specific image sizes for best reproduction Files should be saved as RGB JPGs. Below is a list of ImageSnap’s ceramic tiles and their preferred dimensions. ImageSnap’s minimum dimensions will produce a beautiful printed image, but using the ideal dimensions will slightly increase the image’s clarity. Note: Images may be larger than ImageSnap’s ideal dimensions (which equate to 300 DPI). ImageSnap’s uploading system will not let you use an image on a given product if the resolution is too low. The minimum DPI ImageSnap prints is 120. Note: Your image is delivered to ImageSnap for printing with measurements slightly larger than the tile size. The extra image (approximately .10″) is lost when we print your image edge-to-edge on a tile. For this reason, try to keep important parts of your image at least .25″ from the edge so they won’t be lost during the printing process.